These Specialty Trays round out our insert line, filling the need for such items as miniatures and metal tins. 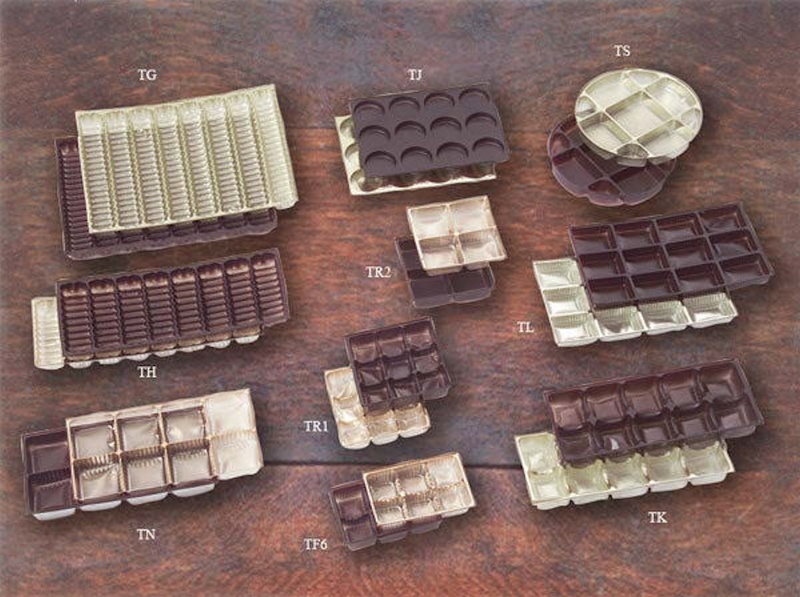 Look to Duerr Packaging for your largest selection of stock candy trays. TF6 3 oz. Tray. Size 4 5/8 x 3 1/16 x 7/8. 6 Cavities, Size 1 1/4 x 1 1/4 x 7/8. TG 1 lb. Miniature Tray. Size 11 1/8 x 8 5/16 x 5/8. 8 Cavities, Size 7 3/4 x 1 1/8 x 5/8. TH 1/2 lb Miniature Tray. Size 11 1/8 x 4 1/4 x 5/8. 8 Cavities, Size 3 3/4 x 1 1/8 x 5/8. TJ Mint Tray. Size 8 x 6 x 5/8. 12 Cavities (Round), Size 1 3/4 x 3/8. TK Strawberry Tray. Size 9 1/2 x 3 7/8 x 1. 10 Cavities, Size 1 1/2 x 1 1/2 x 1 1/8. TN Patty Tray. Size 8 11/16 x 4 1/2 x 3/4. Cavities, Size 2 1/8 x 2 1/8 x 3/4. TR Tray - Size 4 3/8 x 4 3/8 x 7/8. TR1 Size 4 3/8 x 4 3/8 x 7/8. 9 Cavities, Size 1 1/4 x 1 1/4 x 7/8. TR2 Size 4 3/8 x 4 3/8 x 7/8. 4 Cavities, Size 2 1/8 x 2 1/8 x 7/8. TS Round Tray. Size 6 7/8 diameter x 7/8. 9 Cavities, designed to hold 1/2 lb. Fits 7" diameter metal tin.